Barbarians have no preferred target when attacking; they will simply attack the closest building to them. However, once they become aware of enemy Clan Castle troops, Heroes or Skeleton Trap skeletons (either by being attacked themselves or being near another friendly troop under attack), they will leave their previously targeted building and engage the enemy troops instead. Once all of the nearby enemytroops are defeated, they will proceed to attack the nearest building from their current location. The Barbarian is a slow melee unit that attacks its nearest target and has relatively low health and damage. While not a exactly flattering traits, it makes up for it by only taking up 1 supply and having both the shortest training time and elixir cost in the game. Note that the Barbarian scales very well with upgrades, netting particularly large jumps in strength from levels 3 to 4 and from 4 to 5. As a result of the strength of its upgrades, Barbarians remain a viable unit to use in farming and trophy army combinations even at Town Hall 8 and above. 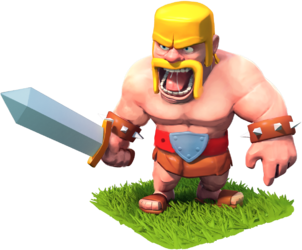 In Clash of Clans, the Barbarian is a unit you should get accustomed to using. If you have read my farming guide, you know that I believe all Barbarian armies are the best army composition to use from Town Hall levels 1-6 and still can be used as a significant chunk of your army composition beyond Town Hall 6. I will discuss specific strategies below. Barbarians make for a great farming and trophy pushing unit. Barbarians train quickly and cost very little elixir. Even if you fail in a raid, you hardly lose anything given these units’ low cost and training time. However, in order to make up for their low health, it is important to understand how to deploy Barbarians, how to attack towers, and how to deal with enemy Clan Castle troops.